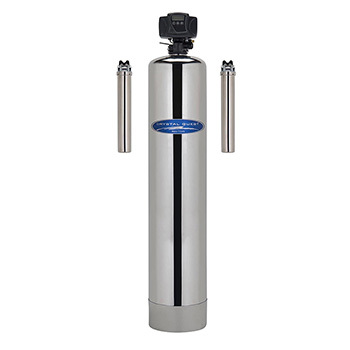 Whole House Iron, Hydrogen Sulfide and Manganese Water Filter, available in 1.5 cubic foot and 2 cubic foot tanks to eliminate virtually any well water iron problems. Filtration System uses media formulated from glauconite green sand; effectively removes iron, manganese and hydrogen sulfide (sulfur smell) rotten egg odor usually found in water. The system is installed in the main water line AND IS MAINTENANCE AND CHEMICAL FREE! When the raw water enters the iron filter, it passes down through the filter media and get oxygenated. The oxygen causes precipitation of the minerals and any iron, manganese or hydrogen sulfide present in your water supply is trapped, resulting in a clean filtered water flow to your household. The filter media can be periodically back-washed for better performance. Comes with automatic backwash controller that can be plugged into regular outlet. System will produce filtered water even without power using just water pressure. No other maintenance on the main tank is required! This is a hands-free system that will work for years to come! 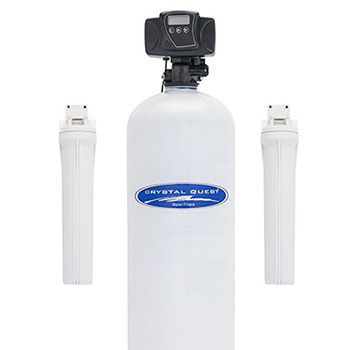 Note: These systems are designed for water supplies with pH between 6.6 and 8.8. 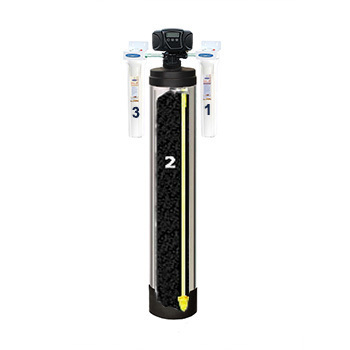 If your water supply have a pH of 6.5 or less, you need to neutralize the pH before it passes through the system with an Acid Neutralizer System. If iron is above 6 ppm, we highly recommend Air Infusion version, which uses additional component to send air into the tank and will produce cleaner results with higher iron levels. Water goes through 3 stages of filtration. In Stage 2, water flows through a large 5' mineral tank that contains Iron and Hydrogen Sulfide reducing media CQ-PY , which can also reduce Manganese. In Stage 3, water flows through a 20"x2.5" solid carbon block filter cartridge. Carbon (also called Charcoal ) has been used in water filtration for centuries. It effectively removes or reduces many contaminants including Volatile Organic Compounds ( VOCs ), insecticides, pesticides and industrial solvents. System comes with Poly Glass mineral tank filled with Iron and Hydrogen sulfide reducing media, two 20"x2.5" filter housings for sediment pre-filter and carbon block post filter, Fleck microprocessor for backwash control, and installation hardware. It comes with media already in the tank. Simple installation with in and out lines and a drain, and needs a power outlet for backwashing (can operate with no backwashing without power from water pressure). CQ-PY is a mixed bed media, which mostly consists of a naturally mined ore, a mineral form of manganese dioxide which has been used in water treatment for more than 75 years. CQ-PY is a granular filtration media for hydrogen sulfide, iron and manganese reduction. The media functions as a catalyst, but itself remains relatively unchanged. Media can be used in conjunction with aeration, chlorination, ozone or other pre-treatment methods for difficult applications. Chlorine or other oxidants accelerate the catalytic reaction. Maximum Flow rate: CQE-WH-01195 - 9-11 GPM ( gallons per minute ) for 1.5 cu.ft, CQE-WH-01196 and Air Infusion - 10-13 GPM for 2 cu.ft. Filter Cartridges Life: (Stage 1 and Stage 3) 3-6 months. 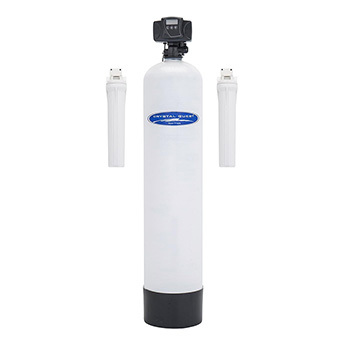 Can be used without sediment pre-filter and carbon block post-filter to be virtually maintenance-free. 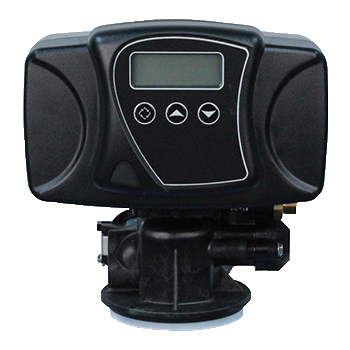 Warranty: Manufacturer's warranty, 1 year whole system, 5 years controller, 10 years tank.